We have this awesome dresser ready to go! 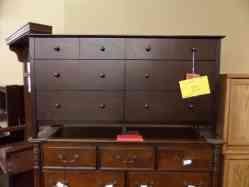 Features a rich brown wood cappuccino finish and matching knobs with six roomy drawers. There are a few nicks here and there, but otherwise it's in great condition. This item is discontinued, that's why it's only $99 as is!